Washington, D.C. – This week the International Code Council, its 64,000 members, and partners from the building construction, design and safety communities, celebrate week 4 of Building Safety Month, “Safeguarding Our Water.” Building Safety Month is an international public awareness campaign that brings attention to building safety, building codes and the officials who apply them. In honor of this week’s theme, the Code Council interviewed Dr. Janet Stout, a world-renowned expert on Legionella and Legionnaire’s disease, for a new episode of the ICC Pulse Podcast. Dr. Stout, president and director of Special Pathogens Laboratory in Pittsburgh and a research associate professor at the University of Pittsburgh, talks about the dangers of Legionella, where it’s most prevalent and how those at risk can protect themselves. Click here to listen to the episode or subscribe on Apple Podcast or Google Play. Clean water is the world’s most precious commodity. From drinking water to bathing water, irrigation to sewage, water is integral to our lives. Building, plumbing and green codes help ensure safe water is available for our families and communities and guards this precious commodity for future generations through proper construction, conservation and safe disposal. 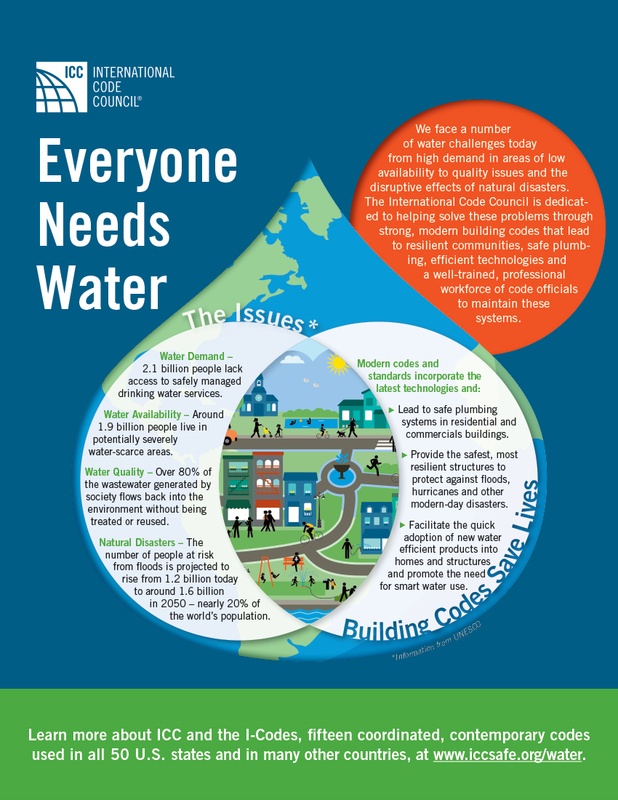 The International Codes (I-Codes), developed by the Code Council and used throughout the world, have addressed water-related issues for years. Building safety codes are lifesavers. In addition to provisions for collecting, storing and using water inside buildings as well as water efficiency measures, the I-Codes include specific provisions to make pools and spas safer. Explore some important backyard and pool safety tips before summer begins in this interactive, digital poster – What Is Wrong with This Picture? Week 4 sponsor Corzan Piping Systems understands the importance of building codes and water safety. “Water safety is a cornerstone of our mission. We are, first and foremost, world-class material scientists, and providing materials for piping systems that not only deliver clean and healthy water, but also resist any sort of disinfection techniques, such as chlorine, that are used upstream, is a critical to that mission,” said Corzan Piping Systems Market Manager Robert Janowiak.